"Labour to keep alive in your breast that little celestial fire called conscience." "Run not in the streets. . .nor with mouth open; go not upon the toes nor in a dancing fashion." George Washington was known as a remarkably modest and courteous man. Humility and flawless manners were so ingrained in his character that he rarely if ever acted without them. The "Rules of Civility and Decent Behavior" that governed Washington's etiquette were by turns practical, inspirational and curious. 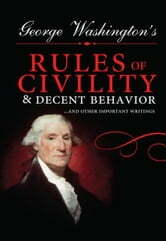 These rules are as instructive and invaluable today as they were hundreds of years ago.